A Malaysian artist and activist has been fined and jailed for producing a caricature of the country's PM. Fahmi Reza's cartoon of Najib Razak sporting clown make-up and arched eyebrows went viral during protests against Mr Najib. The prime minister is under fire over a financial scandal involving an investment fund he founded. A lawyer for Fahmi, 40, told the AFP news agency he was "disappointed" by the decision and would appeal. 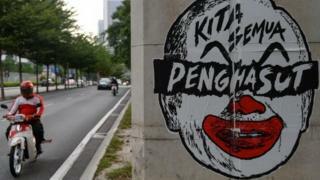 In a court in the northern city of Ipoh, the artist was jailed for a month and fined 30,000 ringgit (£5,500, $7,700). He was found guilty of breaking laws that ban the spread of online content deemed offensive, and faces a second similar charge in another court. Fahmi was arrested in 2016 alongside other activists and opposition leaders. They were part of protests against Mr Najib's handling of a multi-billion dollar money-laundering scandal involving a state fund that was his brainchild. The government has blocked several websites and news outlets carrying negative reports on Mr Najib and 1Malaysia Development Berhad (1MDB), which allegedly misappropriated about $4.5 billion (£3.2 billion). This action was despite a previous government promise not to censor the internet. Both the prime minister and 1MDB deny any wrongdoing. A tough new security law, aimed at stamping out fake news, is believed to be the southeast Asian nation's latest attempt to broaden enforcement powers and penalties against online material deemed harmful to public order and security, Reuters reported. Mr Najib, who has been premier for nine years, must call elections by August. Graphic designer Fahmi is not the first artist to be targeted. A top political cartoonist, with the pen name Zunar, was arrested for sedition in 2016 after regularly mocking Najib and his wife in his drawings.